A detailed analysis and narrative of the Battle of the Sambre 4 November 1918, the British Army's last large-scale, set-piece battle of the Great War. 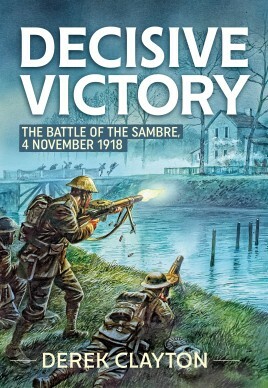 The Battle of the Sambre, 4 November 1918, was a decisive British victory. The battle has, however, been largely neglected by historians: it was the last large-scale, set-piece battle fought by the British Expeditionary Force on the Western Front: the Armistice was only one week away. Seven Victoria Crosses were won and the poet Wilfred Owen was killed in action. In scale it was similar to the first day of the Battle of the Somme: thirteen divisions of the BEF led the assault on a frontage of approximately twenty miles, supported by over a thousand guns, with initial plans presuming an involvement of up to seventy tanks and armoued cars. The German Army was determined to hold a defensive line incorporating the Mormal Forest and the Sambre-Oise Canal, hoping to buy time for a strategic withdrawal to as yet incomplete defensive positions between Antwerp and the Meuse river and thereby negotiate a compromise peace in the spring of 1919. This is the only book devoted solely to this battle and includes original, bespoke, color maps covering every inch of the battlefield. The work analyses the battle at the operational and tactical levels: the BEF was no longer striving for a breakthrough – sequential ‘bite and hold’ was now the accepted method of advance. Drawing on information largely from unpublished archives, including over 300 formation or unit war diaries, Dr Clayton casts a critical eye over the day’s events, examining the difference between plan and reality; the tactical proficiency of units engaged; the competence of commanders, some of whom proved capable of pragmatic flexibility in the face of stubborn enemy resistance and were able to adapt or even abandon original plans in order to ensure ultimate success. The role of the Royal Engineers is also highlighted, their tasks including devising improvised bridging equipment to facilitate the crossing of the waterway. Other questions are raised and answered: to what extent was this an ‘all-arms’ battle? Where does this engagement fit in the context of the BEF’s ‘learning curve’? Was it necessary to fight the battle at all? Was it indeed decisive? Dr Clayton’s analysis places the battle into its wider strategic context and reaches important, new conclusions: that this victory, hard-won as it was by a British army, hampered by logistical, geographical and meteorological constraints and worn down by the almost continuous hard fighting of the summer and autumn, irrevocably and finally crushed the will of the German defenders, leading to a pursuit of a demoralized, broken and beaten army, whose means of continued resistance had been destroyed, thus expediting the armistice. Derek Clayton was born in Yorkshire and attended Batley Grammar School before beginning a long association with the University of Birmingham. He graduated in 1979 with a BA in French and German and went on to teach Modern Languages in three Birmingham schools before retiring in 2015. His fascination with military history began in childhood, but the discovery almost thirty years ago of photographs of his great-uncle in his KOYLI uniform and his grandfather in the RFC focussed his interest squarely on the Great War. He returned to the university in 2004, following the publication of his battalion history: From Pontefract to Picardy: the 9th King’s Own Yorkshire Light Infantry in the First World War (Tempus, 2004), and completed his MA in British First World War Studies, as one of the initial cohort of this course, in 2006, having produced a dissertation on the 49th (West Riding) Division. He then went on to write his doctoral thesis “The Battle of the Sambre: 4 November 1918” – a subject suggested by Professor Peter Simkins - under the supervision of John Bourne, and was awarded his PhD in 2016. He is currently working on a history of the 21st Division in the Great War. Derek is a member of the Western Front Association. He lives in Worcestershire.